Lately, our cute and content Mer has been cute, but not so content in regards to sleeping for naps and bedtime. We aren't really sure what is happening with her and why she is acting this way. My first thought was that it has to be her teeth. However, even after giving her Infant Motrin or Hyland's Teething Tablets (which I am typically a huge fan of by the way), she still wakes up and just cries and cries. Since I love to research, I did some research indicating that it could possibly be that she is coming into a new milestone (which she is-in crawling) and that would be why her little body is waking up as it is overworking right now to reach it. However, I have also suspected some acid reflux. I took her to the chiropractor, which really did seem to help for awhile. But, we are back to not taking the best naps, or waking up a ton before going down for good at night. Needless to say, it is frustrating for me as I have a very busy two year old, so I can't take the time to truly work with Meridian to get her down for naps (nor do I really want to). At night, her constant waking not only wakes up Z (as they share a room), but it also takes away from time with my husband, time to work out, and my time to relax. 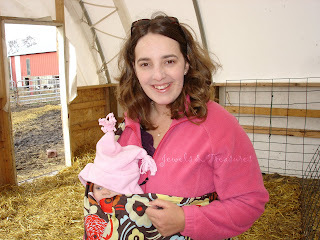 Thus yesterday, in the midst of my Thanksgiving preparation, I brought out the sling! Not only can I be hands free to work around the house with it on, but Meridian can also sleep in it. It still isn't ideal, but it works for now so that I can keep my sanity, and she can get her precious sleep. I currently have three slings. An Ergo, a Beco, and a Peanut Shell. 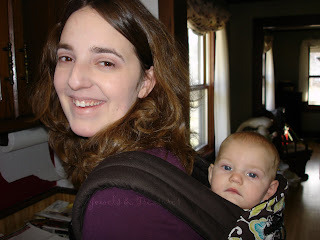 The Ergo and Beco are very similar to each other and the Peanut Shell is more of a pouch. When I had Zoelle, my mom bought for me an Ergo. I loved it. 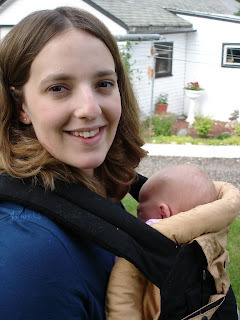 Here is a picture of little Z in the Ergo with me as we were going to work in the garden. Over time, for me, it has been replaced with the Beco. 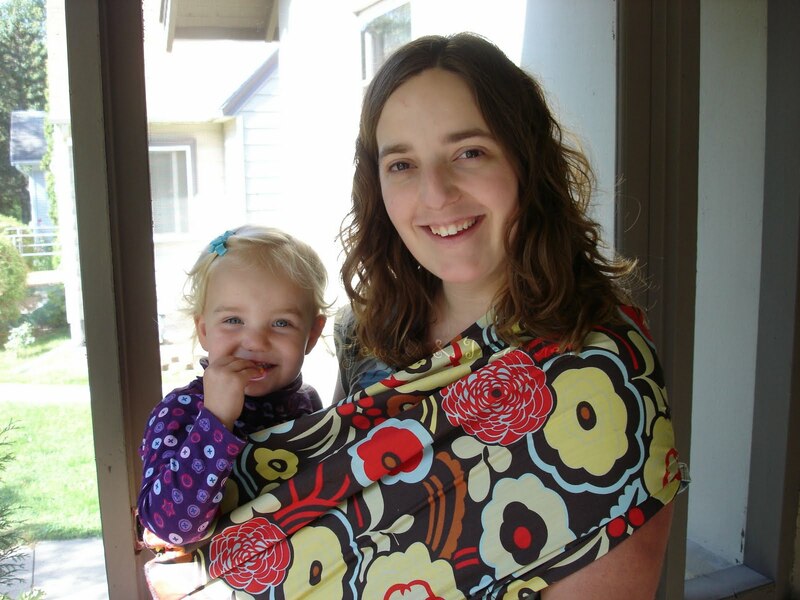 I only like the Beco more because it sits more comfortably on me and I like the colors of it. See-here is Meridian in it as we prepare Thanksgiving dinner. 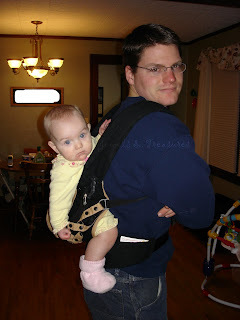 However, the Ergo is handy to keep for Chris to use, or for both of us to babywear a kid. He gave me permission to post this picture of him with Zoelle in the Ergo at 6 months (sorry about the cover up of our last name in the pic. If I knew how to work with my photo editing, I'm sure I could do a much better job). The Peanut Shell is handy to use when they are little as they can stay nice and snug close to you. I plan on using it solely for bonding when we adopt. It can even be used to wear a toddler. At times, I like to wear Zoelle in there. I still would love to try a Mayan Wrap and probably a Mei Tei too. For now, I'll be grateful for the slings I have, as they allow Mer to nap and me to still function.